Imagine being part of the OSIRIS-REx Mission team. You need to plan a mission to space and figure out the best rocket that will accomplish the goal of the mission. 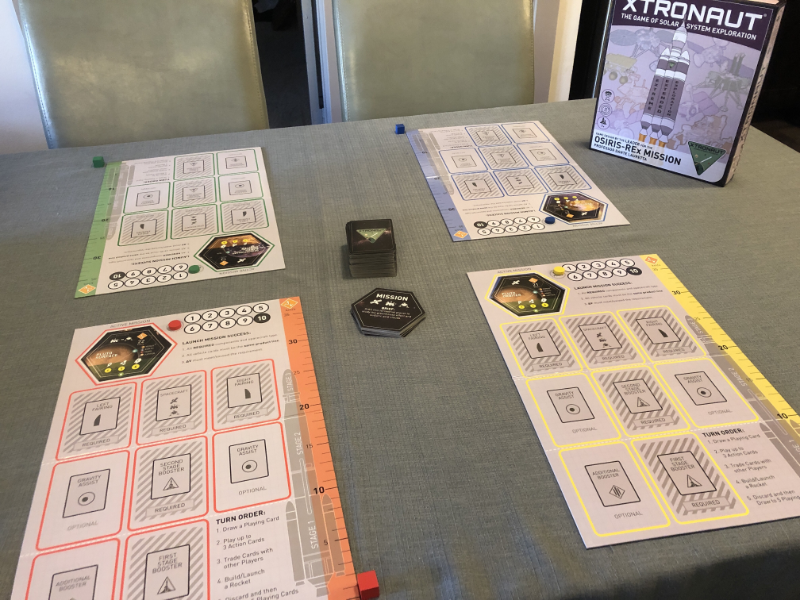 In Xtronaut: The Game of Solar System Exploration you get to build different rockets to accomplish missions. Get to 10 points first and you win! Setup is pretty straight forward. Each player picks a player board as well as the different markers of the same color. All the Playing Cards are shuffled and 5 are dealt to each player. The Mission Cards (hex shaped cards) are also shuffled and 1 is dealt to each player and then placed at the top of their player board. Place all the remaining Playing Cards and Mission Cards facedown within reach of all players. You are ready to begin. The goal of the game is to reach 10 points first. 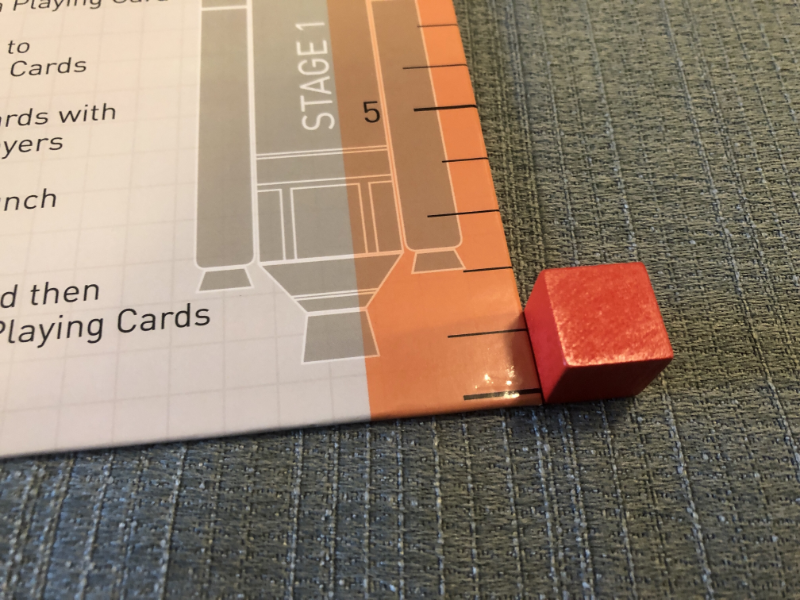 You gain points by building up your rocket on your player board to get to the right delta-V (change in velocity) that is required by your Mission Card. The size of the rocket you use to finish the Mission Card will determine the amount of points you receive. If you don’t reach 10 points after finishing a mission, select a new Mission Card and work to build another rocket to accomplish that new mission. Phase 1: Draw 1 card from the deck – pretty self-explanatory. Draw 1 card from the Playing Cards draw deck. Phase 2: Play up to 3 Action cards. Action cards range from being able to draw more cards, search the discard pile for a specific card, and even make another player discard their Mission card and receive a new one. Phase 3: Trade cards with other players. This is where I believe the game really gets interesting. 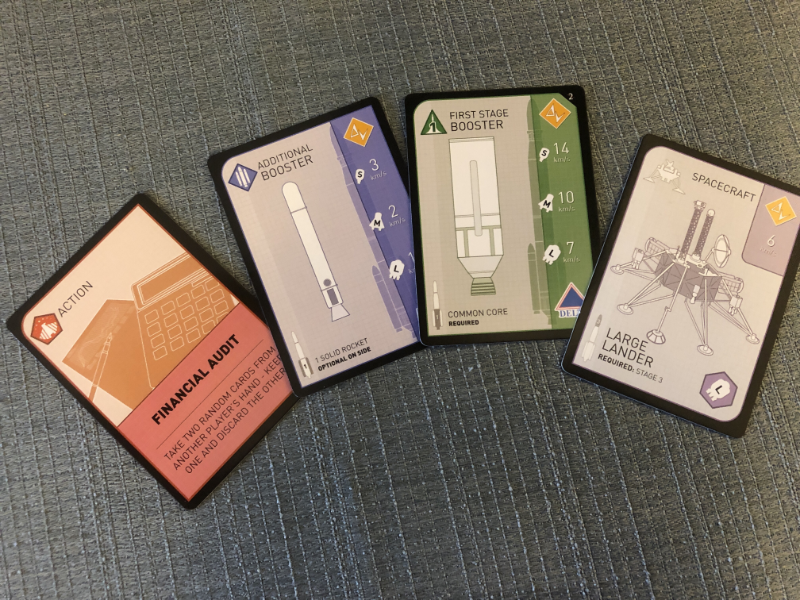 Sometimes you may not have the right cards in your hand to build a particular rocket so you negotiate with other players to get the cards you need. Just be careful! You may get what you need, but in the trade the other player may get that last card they need to build their rocket and win the game. Cards in your hand or even on your player board are all eligible to be traded so you can get pretty crafty with what you trade. Phase 4: Play cards to your player board.This is where you build your rocket. You can place any number of cards from your hand onto your player board. In order to launch a rocket to complete a mission all the parts of the rocket must be from the same Product Line (there are 4 different Product Lines). You can also add Gravity Assist cards that will give you additional delta-V towards your mission, but make sure it is listed on your Mission Card. 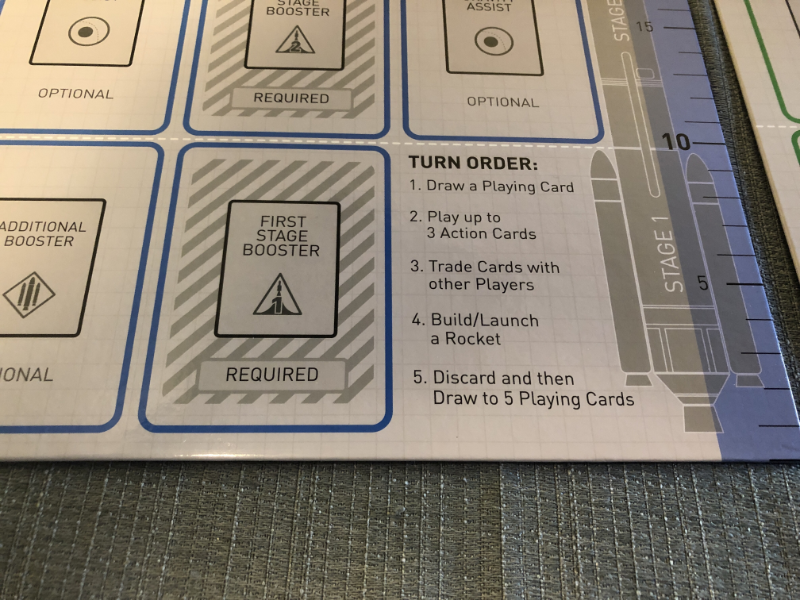 For example, you may have a Gravity Assist card for Jupiter, but your Mission Card only lists Venus, Earth, and Mars; however, another player has Jupiter on their Mission Card so you may be able to trade with them to get that last piece of equipment you need to finish your rocket. Phase 5: Discard cards and draw cards back up to a hand of 5. At the end of your turn you may have cards in your hand that you just can’t use and are having a hard time trading with other players. You can discard some or all of your cards to be able to draw up to a hand of 5 to see if you can get better cards. Play continues clockwise with each player going through all 5 phases of their turn until someone reaches 10 points. The only way players earn points is by accomplishing Mission Cards. The more points a Mission Card gives the harder it is to accomplish. Once a player has completed a mission and has reached 10 points they win; otherwise, they’ll discard the cards on their board, update their game points from the mission, and draw the top 3 Mission Cards face-down. By just looking at the top side of the Mission card which shows a brief description of the mission, the player will chose a new mission to try and accomplish. One positive of this game is the interactivity! The trading aspect of this game can get quite intense. At one point you are discussing a potential trade with one player and then another player interjects with another potential trade. The active player has to be a part of the trade, but that doesn’t mean the two other players aren’t fighting with each other to make their trade sound better. I appreciate the way the designers have integrated actual science into the game play. Each mission requires a specific amount of delta-V (change in velocity) in order for it to be successful. The amount of delta-V shown for each mission is the actual amount of change in velocity needed to launch that particular mission. 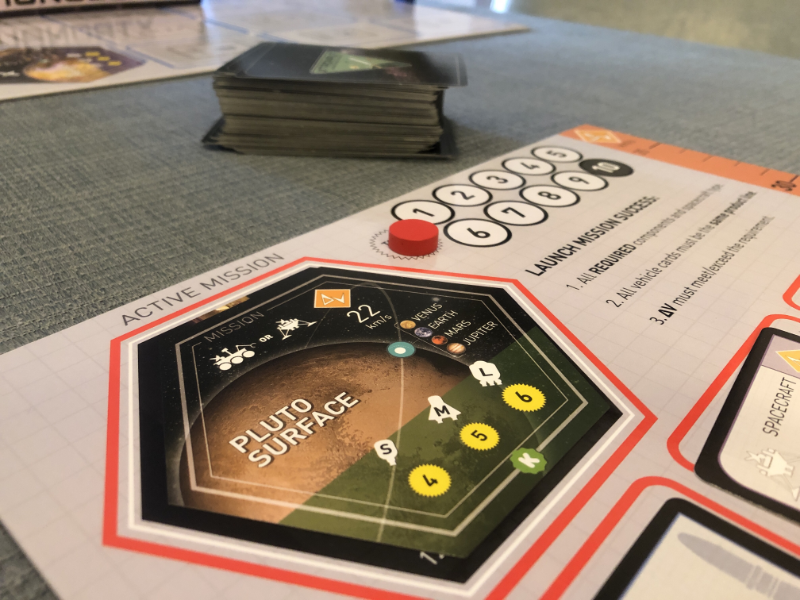 Also, as in actual space missions, just having the required parts is not enough – you’ll need help from other sources (or cards in this game). One help comes from Gravity Assist Cards. These can help increase your delta-V which happens in actual space missions. When a spacecraft flies past a planet it can use its gravity to increase velocity without using any fuel. 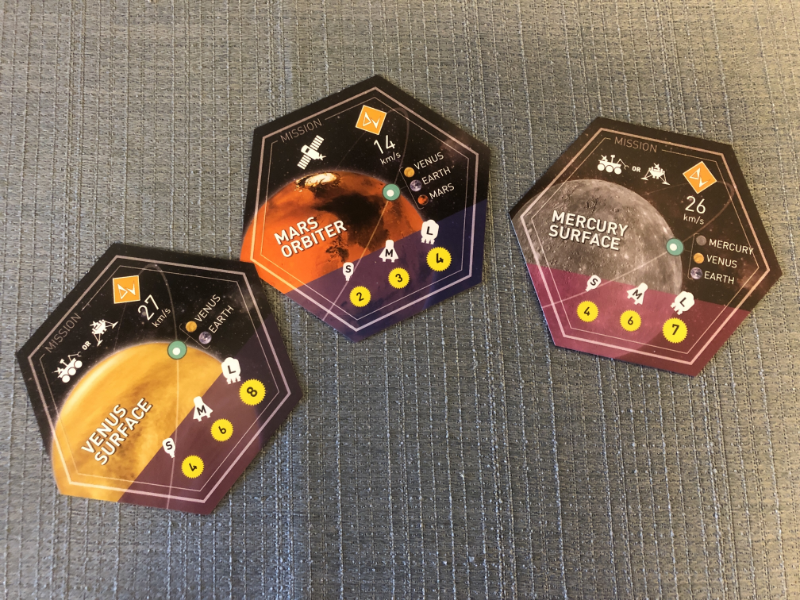 In the game each Gravity Assist card represents a planet and as long as the planet is listed on your Mission Card you can use the Gravity Assist card to give you that extra bit of delta-V you need to complete your mission. For example, if your Mission Card is going to Venus you can use the Venus Gravity Assist card, but you can’t use the Jupiter Gravity Assist card since you wouldn’t be flying past Jupiter on that actual mission. The graphic design isn’t much to write home about. It is simple and works for the game, but with all the games that come out per year that have amazing artwork this one can be easily overlooked. Another negative is the wooden marker for the delta-V track. It is a big wooden block that is way too big for the board. It overlaps the tick marks so it is difficult to see where exactly your delta-V level is. We actually placed it on the outside of the track since the overlapping got a bit confusing. With any game where you are drawing cards there is an element of luck, so being able to trade cards with other players to get the specific cards you need can be helpful. You need to be careful when negotiating though. Yes, you may get a card you need, but in the same trade your opponent may get a card he needs to finish a mission and win the game. So, since the trading can help alleviate some of the luck of the game it does not work well in a 2-player game. The trading step doesn’t happen that often in a 2-player game because you are just going to help the other person win, or vice-versa. Your strategy therefore has to change a bit when playing 2-player so instead of trading you tend to keep cards in your hand that will help you for your next mission. The player interaction can be a lot of fun in this game and it just doesn’t exist in the 2-player game. Depending on how the cards turn up for each player and whether players are willing to negotiate the game can overstay its welcome. There are quite a few rounds where you are just not getting the cards you need. You can’t trade with other players because you don’t have what they need and when you discard and draw new cards at the end of your turn you could still get unusable cards. When this happens after a few rounds the game can just draw out. Overall, this is a pretty simple game. Game play doesn’t take long to explain and each step is clearly displayed on each player board so you don’t have to remember when to do what step. It can get frustrating at times when you can’t get the cards you need, but it can be fun to try and negotiate with fellow players. That being said this isn’t a game I’m itching to play again. I feel like I’ve gotten my play out of it and have seen all that there is to see. I gravitate toward games that look pretty so when I saw this game it didn’t immediately draw me in. I’m willing to try any game out, but the game play was almost too simple for me and was just way too frustrating at times. I do give props to the designers for trying to create a game that incorporates the science of getting a rocket into orbit, I just felt it slightly missed the bar on being a replayable, enjoyable game. Next postHare and Tortoise Review – Hare today… still here tomorrow! When I'm not playing games, I'm either reading articles about them or watching videos. To say I'm obsessed would be an understatement... and I'm ok with that! My husband and I got into the hobby a few years ago when friends introduced us to Small World and Kingsburg and I fell in love! Since then I've delved right into the hobby and haven't looked back! I enjoy story driven games like Eldritch Horror and Near and Far but am willing to play anything - even those dry Euros... well, except Agricola.